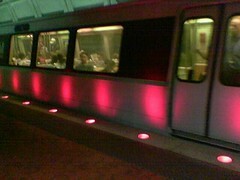 Metro’s deathly red LED platform edge lights have come to Union Station. They kill space spores that the train may have picked up along the way. Only deadly to aliens. I hope the colored lights reflect what line the train is on. Although that would be tricky on the Green/Yellow line.